This year being the 400th anniversary of the opening of the New River in 1613 – a pioneering work of civil engineering which created a canal from Hertford to Islington bringing fresh water to the city – a group from the Clissold Park User Group in Hackney recently took a walk out to the source. We did this because the New River once flowed through the Clissold Park and a remnant of it is still to be seen, retained as an ornamental feature, and very lovely it is too. 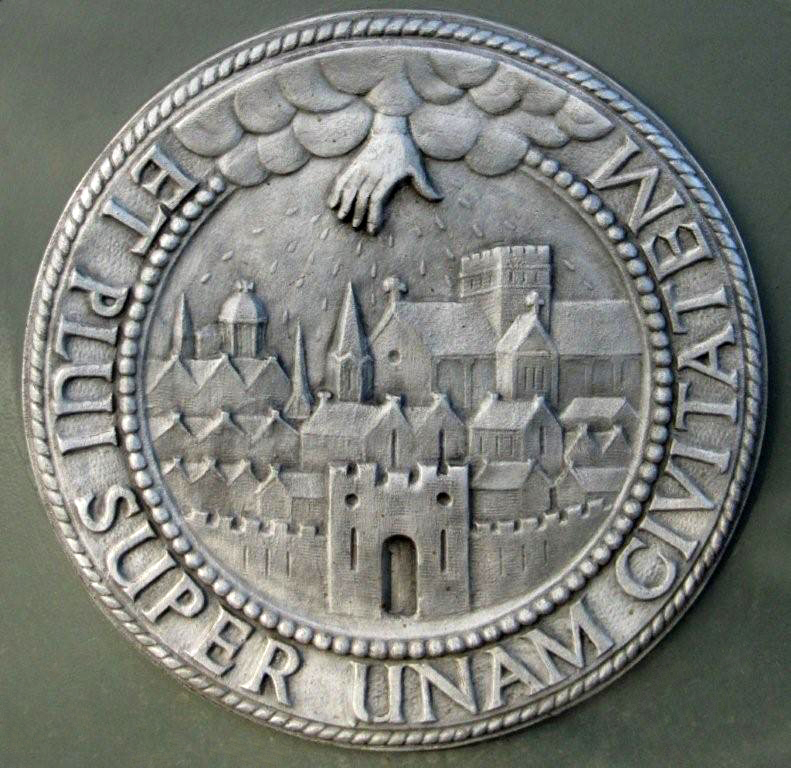 The two new pedestrian bridges in the park bear emblems designed for the New River Company: ET PLUI SUPER UNAM CIVITATION: And I rained over one city (Amos 4.7). To be honest we didn’t walk all the way, but caught a train from Stoke Newington to Hertford East, walked along the River Lea for while, and then took up the New River trail at Ware. The River Lea and the New River are two great historical lifelines in the landscape of north London and the Essex borders, severing east-west connections in some places and defining county boundaries in others. Both canalised rivers connect the meadows, streams and water-courses of Essex and Hertfordshire to the city and London’s East End. 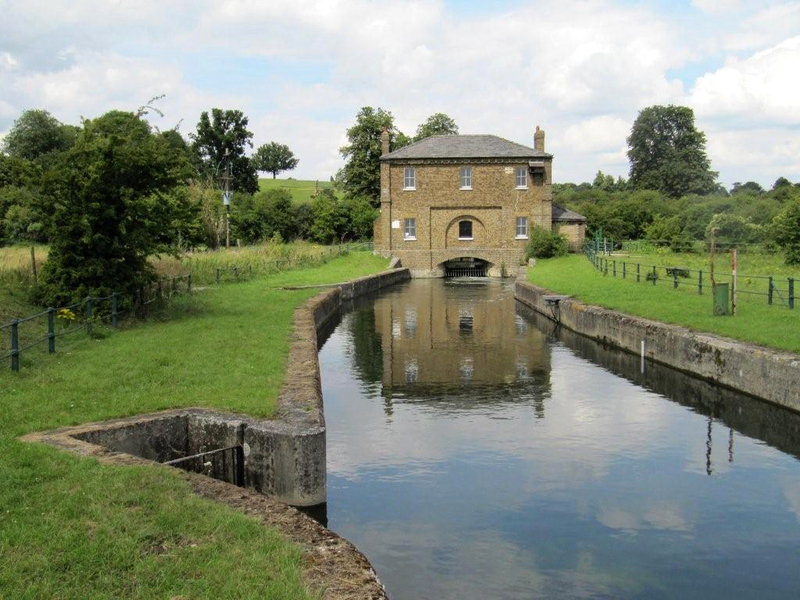 Today the bulk of the water feeding the New River comes through a cut into the River Lea just south of Hertford, where the handsome New Gauge House (1856) still stands and is pictured here. Some 22 million gallons of water passed each day into the New River from the Lea at peak times, destined as drinking water for the expanding city. The number of lives which were saved as a result of this new source of clean drinking water is incalculable. The New River is a triumph of construction and engineering detail. The canal was ten foot wide and five feet deep, mostly hand-excavated over a thirty month period, with between 120 and 300 men working at any one time. There are no locks. The flow of water is determined by the tiniest of gradients, a matter of five inches per mile, which was achieved to perfection even without the surveying technology we have today. Hence the mixture of the straight and the winding, covering some 24 miles in length from Hertford to Stoke Newington (though it originally finished at the New River Head next to Sadlers Wells). Whether flowing through the open fields of Hertfordshire or through the Georgian streets of Enfield and Islington, the New River was – and in some places still is – serenely beautiful. The accompanying gauge-houses, bridges, railings and gates from the Victorian era were elegantly designed, and a reminder of an age when such utilities – especially water, but electricity too – developed a coherent, elegant architectural style of their own. Utility networks have been a crucial feature of the landscape since the industrial revolution, but the discussion about their style and presence in the landscape remains strangely overlooked. One of us read George Monbiot’s new book while staying in the house of friends who had gone canoe-camping in the Yukon. The precautions required against attacks by bears – both black and grizzly – were formidable, they told us. No cooking or eating within 100 yards of the tents, no food or clothing associated with food to be left near the tents, all pots, pans and cutlery to be scrupulously cleaned and stored at a distance, and so on. For added protection they had Mace cans and knives and axes to hand, non-Canadian citizens being prohibited from carrying guns. In many parts of the world it is still dangerous ‘out there’, beyond the street lights, farms and houses. If it isn’t the dangers posed by dangerous animals and reptiles, there is hostile terrain of other kinds – mountain avalanches, land-slides, desert conditions – in addition to swollen rivers and treacherous seas. People take their lives in their hands when they go into the landscape, though rarely in Britain, where the topography has largely been tamed. As Monbiot points out, we want wild animals in other people’s countries – we’ll even raise money to protect them there – but not in ours, thank you very much. Sheep – the bêtes noires of Monbiot’s chapters on the deforested bleakness of Britain’s uplands – are as wild and woolly as we can cope with. The UK now lags well behind most European countries in pursuing the new ecological strategy of ‘re-wilding’, a term which only entered the dictionary in 2011, but is now to be found everywhere. The arguments for bringing back wolves, bears, eagles, beavers, and other species once common in many parts of Europe, is not simply for their exotic, almost atavistic spectre, but for sound ecological reasons. The higher the range of the chain of predation, the greater the variety of species which are given a niche in which to flourish. Or so we are told. Apart from the ecological arguments, which are clearly and persuasively spelt out, Monbiot is happy to admit that he also wants to re-wild the British landscape because he is bored. We live today, he argues, a life of restraint and sublimation, untouched by the thrill of fields, rivers and skies populated with creatures which now belong to mythology or history, but which we have eradicated in the name of the common good. He is not alone in feeling that on those occasions when we see particular creatures still at large in the landscape or out at sea – a brown hare, a bittern, a sky darkened by clouds of Brent geese, a colony of seals or a school of porpoises – we regard those days as somehow blessed. Farm subsidies, together with a high concentration of land ownership in the hands of a tiny proportion of the population, have rendered discussions about the ‘nature’ of the countryside in modern Britain beyond political debate. There is an assumption that what is good for farmers and land-owners must necessarily be good for everybody else. The same is true of the multi-national fishing industry and its industrialisation of the sea. But the absolute separation of economy from geography is no longer sustainable, and new forms of settlement and livelihood are surely needed to overcome the disastrous separation of town and country, work and play. Monbiot is honest enough to admit there are no easy answers, and that indeed on many aspects of re-wilding he may be wrong. There is much to discuss in this provocative book, but do we have enough time? 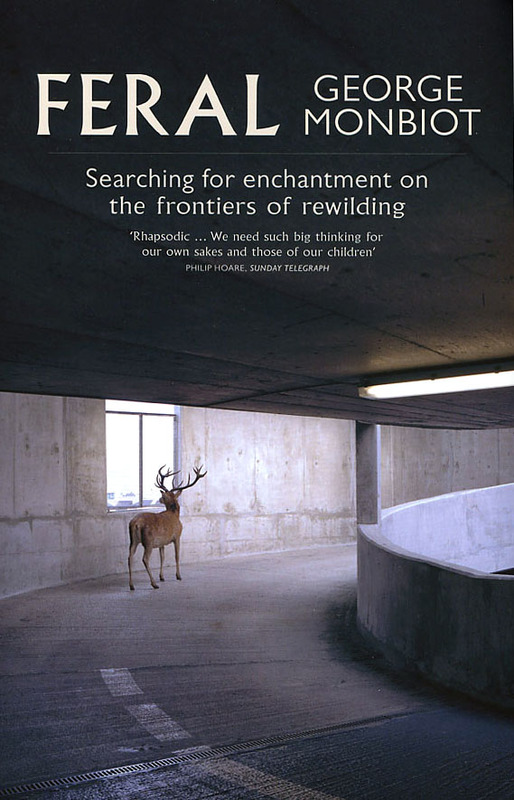 George Monbiot, Feral: Searching for Enchantment on the Frontiers of Rewilding, Allen Lane, 2013.